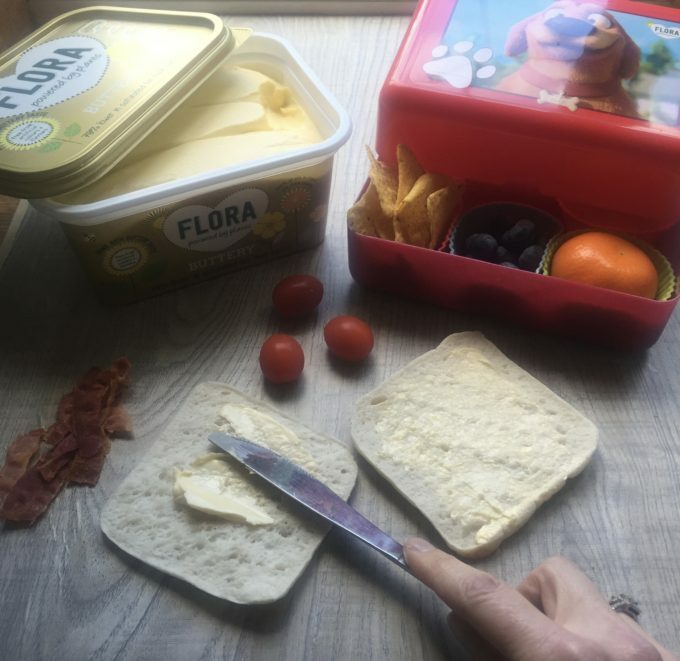 I’ve recently seen the staggering results from a recent survey conducted by Leeds University, commissioned by Flora where only 1.6% of lunch boxes are considered to meet the nutritional standards set for primary school meals here in the UK! That’s 98.4% that don’t contain the right nutritional value i.e. have too many snacks and not enough balance. Furthermore, only ONE in FIVE, that’s 17% of lunch boxes contain any kind of vegetable or salad! With this in mind, Flora are on a mission and are intent on helping the nation pack a healthier lunch for their kids! We jumped at the chance to work with Flora and embrace the healthy lunchbox challenge they have set us. 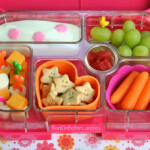 The lunchbox challenge: to come up with some quick, easy fun ways to help make a lunchbox healthy. How to pack a healthy lunchbox? 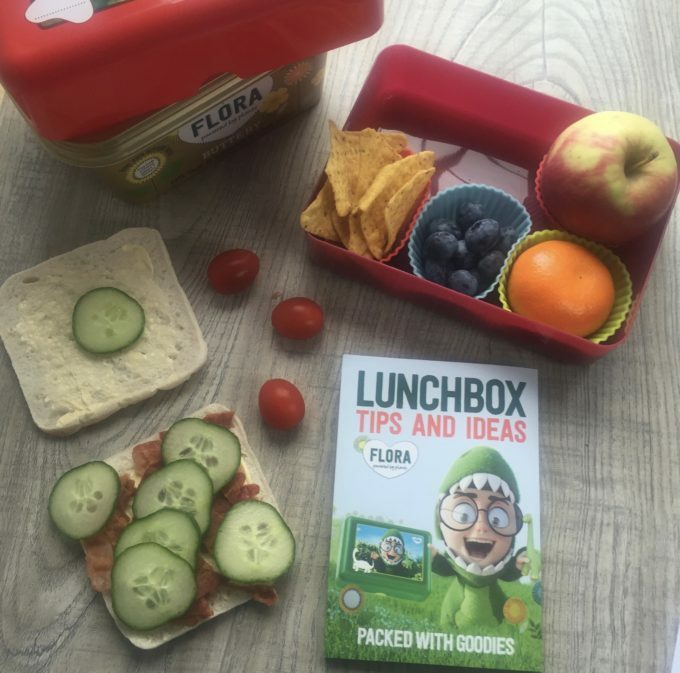 Flora have created a brilliant lunch box tips leaflet, and over 631,000 have already been distributed throughout the UK. 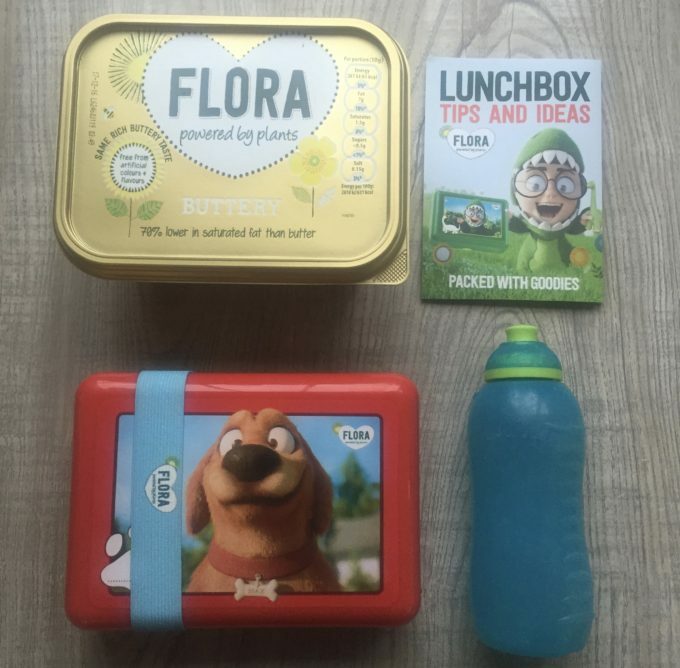 Visit Flora to view their online lunchbox guide. There are also lots of useful handy tips and tricks on the Flora website. So do hop on over for some ideas, but before you do, just check out some of our handy tips and hints. What is my lunchbox routine? I try to plan a weeks worth of lunch boxes, so I know I have all the necessaries in the fridge, cupboard, fruit bowl etc to take the stress out of packing lunches. This means doing the food shop with a pre-prepared list. I get the kids to input into what sandwich fillings they want. It’s important to include them in the process and routine. The kids then try out different combo’s and try and load up sandwiches as they do in the local Subway. My daily routine: up at 0630 as Spike, the middle one, leaves first at 0710 to catch the school bus through the local villages to deliver him at school at 0830. So my first job is to make the packed lunches, having previously agreed with the kids what they’ll be having, as laid out on a weekly lunchbox planner. 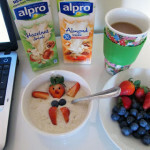 Then encourage the kids to have a wholesome breakfast before heading off to school. All the kids are gone by 0735 now they are at secondary school, so in our household, the day starts early!! We also go through phases to be honest, and I suppose it depends on the season we are in. For instance, Autumn and Winter months are more of a challenge I think. That’s when I tend to move towards wide-neck flasks, heart warming food, foods containing oats for that slow release of energy… Spring, Summer tend to be more finger food based, DIY sandwiches that they assemble themselves. So what’s the challenge right now? 3) with my kids, they tend to shoot up and do a lot of their growing over the summer holidays so Autumn term tends to need a step-change in the amount I pack in their lunch boxes. They simply need more fuel the older they get. 4) The kids are also in a phase of NOT wanting sandwiches. They want variety in textures, flavours, look and appeal and lots of it! You may have seen the chat on Facebook last week, where lots of advice was being shared on pasta salad lunches, couscous and other alternatives. 5) it has to be quick to eat. The kids want to eat fast and then get out and play, chat with their mates, move on. They don’t have that luxury of time to savour their lunch. I wish they did, but it seems to be the reality in school. If you are a regular reader of Lunchbox World, you will know our mantra – we are all about putting the FUN back into packed lunches. So do have a good look around the site for lots of healthy tips, tricks and lunchbox ideas, food art ideas and also be sure to follow @lunchboxworld on social media too. Our mission : to find fun, clever, quick ways to make the lunchbox look nice, healthy and encourage the kids to eat it, so the lunchbox comes home empty. The kids are happy, and then the adults are happy! With my youngest, he is the most fussy eater of the 3, King Julien we call him. Recently, whenever an apple goes in his lunch box into school, it comes back again at the end of the day. I have now resorted to leaving it out of the lunch box, chopping up the apple and giving it to him whilst doing his homework back home after school. This way I can be sure at least he is getting one of his 5 a day after school. I also encourage the kids to have fruit at breakfast. It doesn’t all have to go in their lunchbox, as long as they are getting the balance throughout the day or by the end of the day. Often my kids complain about taking bananas to school, they bruise so easily, they brown, and then they are just too unappealing to be eaten… You must have heard the excuses too. We’ve tried the banana guards which work but they are bulky. The solution for us: the kids now have a banana at breakfast, maybe half at breakfast and the other half after school. I still ensure the kids eat the fruit, but maybe some days it’s just not all in the lunch box. My boys are in their teen years, they kick back unfortunately. I kick back too but we have to find a middle road sometimes. Just like last week with the pasta salad. I now have a little salad pot I pop the dressing in, prepare the salad dry, without the dressing, so there is no chance of it leaking all over his exercises books within his school bag. We have to evolve and find ways that work with each of our children, grit our teeth but carry on, knowing we are here to guide them with healthy eating. There are many other fruit options that can go in a lunchbox: a handful of grapes, dried apricots, dried raisins, dried mango, dried pineapple, blueberries, fruits that don’t seem be bruise so easily. Check out our nutrition section and also our 5 a day post for more information. Now the oldest is off at Uni, I now have a bit more time, (or so it feels), so this term I have now set myself, our family the healthy lunchbox challenge. Each week I have to cook up and prepare something new for their lunchbox. 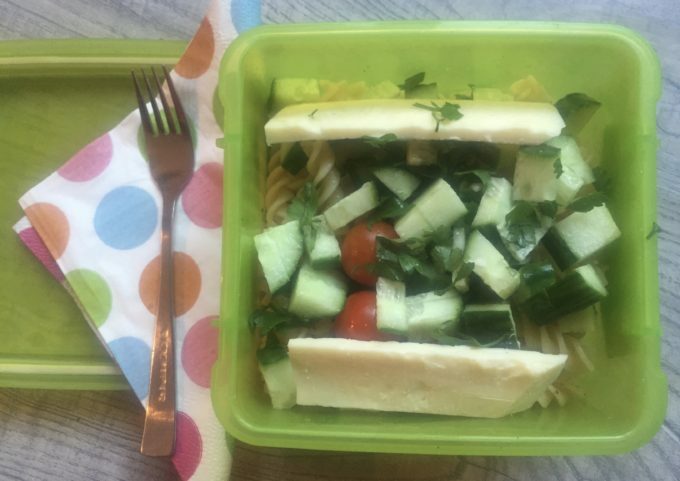 It can be sweet or savoury: a new salad idea, a new pasta idea, a new savoury idea or a new sweet idea, keeping their lunch boxes fresh, exciting and to keep me free from stumbling into a lunchbox rut! So below I am sharing the last three lunch box ideas where two are NOT sandwich based! Last week it was the turn of a new pasta salad. I often make this for when the kids are competing and need a quick pasta! This is made from pasta twirls, chopped cucumber, cherry tomatoes, cheddar cheese, chopped parsley with a french dressing now on the side, and is added just before eating! To vary the pasta salad try looking out for fun, different colourful pasta shapes. I just found Autumn leaves and pumpkin shaped pasta that’s perfect for this time of year! Next week, we’re baking up savoury muffins – I thought cheese and ham (or chopped bacon or pancetta) savoury muffins, using Flora Buttery. Check back to see that creation! If you find a recipe you fancy trying but don’t have all the ingredients, and no time to shop, then see what could be substituted. For instance, if the recipe says ham, you could try bacon or lardons instead. Try and experiment with flavours or try swapping in a veggie instead! For more ideas and inspiration, do check out our recipe section. Here’s to helping you put the FUN back into packing lunches! 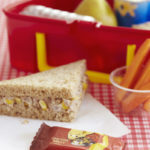 So now over to you, how do you keep the lunch boxes balanced and healthy for your kids? We love hearing from you so please, like and share and make our day! 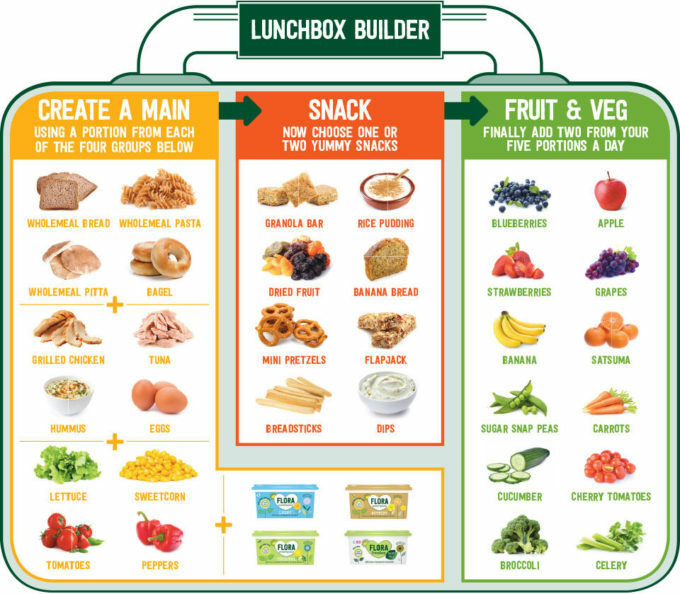 Feel free to set yourself your own healthy lunchbox challenge! This post is an entry for the #FloraLunchbox Linky Challenge, sponsored by Flora. Check out their lunch planner and recipe ideas on the Flora website. Every tub of Flora contained plant oils, such as sunflower, rapeseed and linseed oils. Flora is lower in saturated fats than butter and provides a source of healthy Omega 3 and 6. These essential fats contribute to the maintenance of normal blood cholesterol levels and are needed to support the development and healthy growth of children. The Flora rate is approved by the Vegetarian Society.